We have worked with over 40 local school districts to help them ensure their students reach their greatest potential! 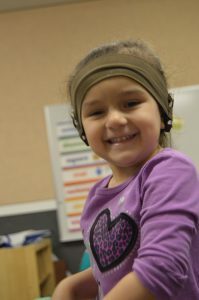 Children with hearing loss sometimes struggle in general education classrooms and it can be difficult to find the resources necessary to help them. Our Mainstream Support Specialists will work directly with students and the professionals in local classrooms in support of auditory skills, social and self-advocacy skills, and academic performance. If your child attends St. Joseph Institute on-site school programs, our Mainstream Support Specialists help to ensure a smooth transition from our school to your own community school. Call us at 317-471-8560 for more information.